April 18, 2019: April precipitation has been about average plus or minus an inch or so. Temperatures have been running 3 to over 5 degrees above average. Over the past 90 days, precipitation has been 1 to over 5 inches above normal. Current (April 18) streamflow data from the U.S. Geological Survey shows that streamflows are near or above normal. Groundwater levels are above normal. The weather outlook through the end of April calls for above average rainfall. Temperatures are expected to be above or much above normal. The NWS Climate Prediction Center's 30 day outlook for May calls for near average precipitation and above normal temperatures. The 90 day outlook for May through July calls for above average precipitation and above average temperatures. The outlook for water resources and water supplies is good or very good. 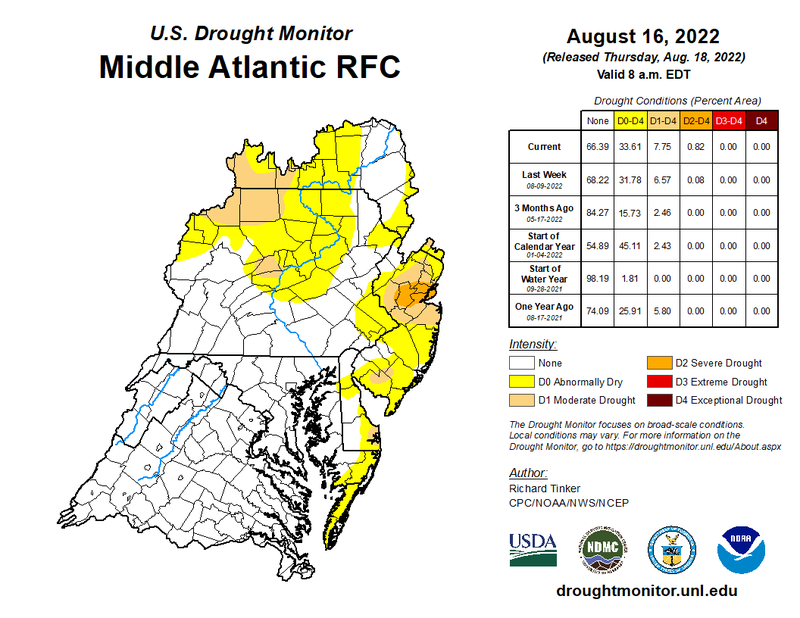 As spring overspreads the region and water usage increases, rainfall deficits (which the forecast suggests are unlikely in the near term) could lead to a deterioration in these conditions.